November 10, 2009: I grow chillis in my back garden in tubs - three plants to a tub. Even in poor summers, they produce a crop which provides me with plenty of chillis to keep us going over winter and into the next year, and enough to share with family and friends as well. This year, I grew four varieties: Cayenne, Joe's Long Cayenne (and they were long - up to 6inches); Numex Twilight and Fiesta. The last two look like little chilli-coloured bullets and are much hotter than the others. In previous years I have tried jalapenos (reliable but a trifle dull), orange cayenne and Big Sun; I'm also looking for some dwarf varieties for next year. What I like about growing chillis, apart from the fact that they are very attractive plants and ridiculously easy to grow, is that you never really have a glut that's overwhelming. There are lots of things you can do with chillis and they keep well on the plant or in the bottom of the fridge while you find time to hang them up or make that jelly. A straightforward pickling recipe from Jamie Oliver’s Naked Chef. He stipulates medium green chillis; I use this recipe for my little bullet-shaped flavour bombs. They lose their colour a little bit in the brine, but none of their flavour. Carefully score the chillis from the stalk end to the tip one one side only and remove the seeds (use the handle of a teaspoon for this). 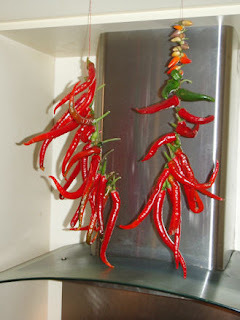 Pour boiling water over the chillis, let them sit for 5 mins, then drain. This will get rid of most of the seeds left behind. Sterilise jars by washing, then rinsing, in very hot soapy water. Then leave the jars to dry in the oven at 120 degrees. Wash the plums, dry them, cut in half lengthways and remove the stones. Wash and dry the chillis, trim the stalks and pierce the chillis a few times. Heat the vinegar, water, sugar, spices and salt in a pan. Pack the plums, chillis and bay leaves evenly among the jars. When the pickling liquor comes to the boil, remove from the heat and pour into the jars. Stir the jars with a clean spoon to let any trapped air escape, the seal the jars and cover. Leave to cool, then put into the fridge. Destalk the chillis and remove the seeds if you wish. Chop roughly and put in the goblet of a blender with a little water to help swish them along. Blend until you have a rough puree. Squash the pulp into ice cube trays and freeze, then pop the cubes into polythene freezer-proof bags. Every time you want a chilli hit, you can either use a whole cube or chip a bit off as required. Thread a needle with ordinary sewing thread and tie the ends in a knot so that you have a double strand to sew with. Then thread the chillis together – just push the needle through the stalk of each chilli. Once you have your chilli ‘chain’, hang it up somewhere with plenty of airflow. Mine are suspended from the top of the kitchen cabinets immediately above the cooker hood. Then every time you want a chilli, just snip one off with scissors. These keep for months, although they will lose colour a little bit. This is based on Nigella Lawson’s beautiful chilli-flecked jelly or jam, the recipe for which is published in her Christmas book and also at http://www.nigella.com/recipe/recipe_detail.aspx?rid=20157. I say based on because the first time I tried it, it needed longer than the 10-minute boil that Nigella stipulates and I ended up finding it easier to test for a set the traditional way, even though Nigella says this is all too difficult and time-consuming (no, it isn’t). Since then I have also used apple juice as well as water as the base liquor which I think gives it a deeper, more fruity flavour – without being obviously appley. But I love having the fragments of chilli suspended in the jelly in the way that Nigella suggests, so this recipe is a mixture of hers and my own. 150g long fresh red chillies. Squeeze the lemon juice into a large pan. Add 75ml of the vinegar. Chop the apples roughly – no need to peel or core them – and add to the pan along with the water. Bring to the boil and simmer for an hour. Strain overnight through a jellybag, leaving the liquid to drip through into a bowl underneath. You should end up with about 250ml apple juice. Next day, sterilise your jars by washing them in very hot soapy water, rinsing in very hot water then leaving to dry in the oven at 120 degrees. Deseed the chillis and cut into about four pieces. Core and deseed the red peppers and cut into rough chunks. Put the cut-up chillies into a food processor and pulse until they are finely chopped. Add the chunks of red pepper and pulse again until you have a vibrantly red-flecked processor bowl. Dissolve the sugar in the rest of the vinegar in a wide, medium-sized pan over a low heat without stirring. Add 250ml apple juice. Scrape the chilli-pepper mixture out of the bowl and add to the pan. Bring the pan to the boil, then leave it at a rollicking boil for 10 minutes. Start testing for a set: take a clean teaspoon and a clean side plate. Spoon 2 teasps of the jelly mixture on to the plate. Leave to cool for a couple of minutes then push a fingertip (which will, of course, also be very clean) through the middle of the pool of jelly mixture on the plate. If your fingertip parts the jelly into two sides which then stay separated AND the jelly you’re pushing away wrinkles nicely, then you have a set. The first time or two that you try, you will probably separate the jelly liquor into two separate pools but there will be no wrinkling. Clean the plate and spoon and leave the pan boiling for another 3-4 minutes before testing again. You should really remove the pan from the heat when you’re testing (in case it has set already) but in practice I only start doing this when I know the liquor is close to setting anyway. After about 40 minutes, or once the red flecks are more or less evenly dispersed in the jelly (as the liquid firms up, the hints of chilli and pepper start being suspended in it rather than floating on it), ladle into your jars. If you want to stir gently at this stage, it will do no harm. Then seal tightly.